On the surface, England's one-day series in Sri Lanka looks like ideal preparation for the World Cup. For the first time, they have a chance to focus on 50-over cricket for a concerted period of time, without the disruption of games in other formats. The aim will be to settle on a strategy and a group of personnel capable of surprising a few people in Australia and New Zealand next year. However, given the conditions in Sri Lanka and their contrast to those down under, the quality of the opposition and the absence of key players such as James Anderson and Stuart Broad, the tour could end up raising more questions than answers to England's problems in the one-day format. A heavy defeat, and England would be heading to Australia for the tri-series in January in damage-limitation mode. Here is my assessment of the challenges facing Alastair Cook and his men ahead of their seven-match series, which begins on Wednesday. I'm a bit disappointed that England appear to have dropped Alex Hales from the top of the order. They desperately need to be more punchy up front and I want to see a guy up there who plays big shots and puts some pressure on the opposition bowlers in the powerplay. As regular readers will know, I would prefer not to have Cook in the side, but England have put faith in him as their captain and opener, so the issue is who plays alongside him. Moeen Ali, who scored a quickfire 50 against Sri Lanka A last week, has a good range of strokes. He is a graceful left-hander, who at times last summer reminded me of David Gower. But Hales is a more powerful hitter, who has proved in Twenty20 international cricket that he can play match-winning innings against the world's best bowlers, and I would have liked to have seen him given the opportunity. As things stand, with Ian Bell batting at three, Moeen will be under pressure to produce in every game. If he fails, England could find themselves 2-1 with Cook and Bell at the crease, which is hardly the most intimidating proposition during those crucial powerplay overs. "The shocking injury suffered by Phil Hughes on Tuesday is a stark reminder of the dangers faced by cricketers when the ball is coming at them at speeds of up to 90mph. Anyone who has played the game at any level will be hoping and praying that the Australia batsman comes through this." 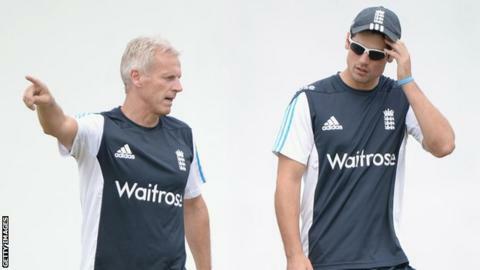 England batting coach Mark Ramprakash has talked about playing with "flair and confidence" but that is much easier said than done. A positive approach is born out of winning games and series, something England have found incredibly difficult in one-day cricket of late. England desperately need firepower - players capable of clearing the boundary ropes at will - but they also need batsmen who adapt to the situation, can knuckle down and bat for 35 overs if required. There has been talk of Ben Stokes moving up the order and that is certainly an option worth considering. Stokes lost his way a bit with England last summer with the bat, but anyone who saw his Test hundred in Perth will be fully aware that he can play the long innings. He is a powerful hitter, but he does have a good technique to fall back on if he finds himself batting early with the ball still hard and the bowlers' tails up. With Anderson and Broad both missing through injury, Steven Finn finds himself as the senior bowler in the England party and this is a great opportunity for him to re-establish himself as an international cricketer. Deemed "not selectable" last winter as his game and confidence fell to pieces, Finn needs not only to feel his way back into the side but to prove that he is the man to turn to when times are tough. Nobody is doubting Finn's talent. He is tall, fast and has always been a wicket-taker, but he has to prove to his captain that he can offer control and hold his nerve even when the batsmen are on top. He needs to bowl one side of the wicket, at the required length, and allow the ball and the pitch to do the rest. If one-day cricket was a box-ticking exercise, England would score very well because their squad covers most of the key bases. In James Taylor and Hales, they have fluent batsmen who have played well in county one-day cricket, as well as Eoin Morgan, who thinks and breathes one-day cricket. The have a couple of batsmen who can bowl in Joe Root and Ravi Bopara, and an effective front-line spinner in James Tredwell. If Finn can step up to the plate, he has some handy bowling all-rounders alongside him in Chris Jordan and Chris Woakes, as well as Harry Gurney as a left-arm alternative. Woakes looks more of a handful now has he added some pace to his bowling, while Jordan has proved himself to be an explosive bowler, batsman and fielder. I just hope he has worked on his run-up, because it was clearly hampering his pace and rhythm last summer. What they must not do is keep to short-term plans: to try someone for two games and then change it if it hasn't worked. There is no harm in tinkering occasionally, but to imbue the side with confidence, you need to go out there with a plan in place and put faith in a core group of players. A one-day series in Sri Lanka is a tough gig for any side but England have got to show they are capable of winning. They must at least hint at progress, provide evidence that they are developing a team and tactics that can compete at the World Cup. After all, it will be much easier for Broad and Anderson to come into a team that has built up some confidence than one that is battening down the hatches after another morale-sapping loss. As things stand, England are very much underdogs for the World Cup, but that is not necessarily a bad place to be. If they can get beyond the quarter-finals, they will have had a good tournament. Anything more than that really would be a turn-up.